August 3rd- We Like to Move It! Stretch, bend, mov and learn during free classes along the boulevard. Enjoy physical fitness activities, games and plent of fun for all ages with the Manhattan skyline as a backdrop. Ongoing fitness and movement lasses, CrossFit demonstrations, NYC Park DEpt Playmobile and Imagination Playground, live music and much more that will make you want to move it! 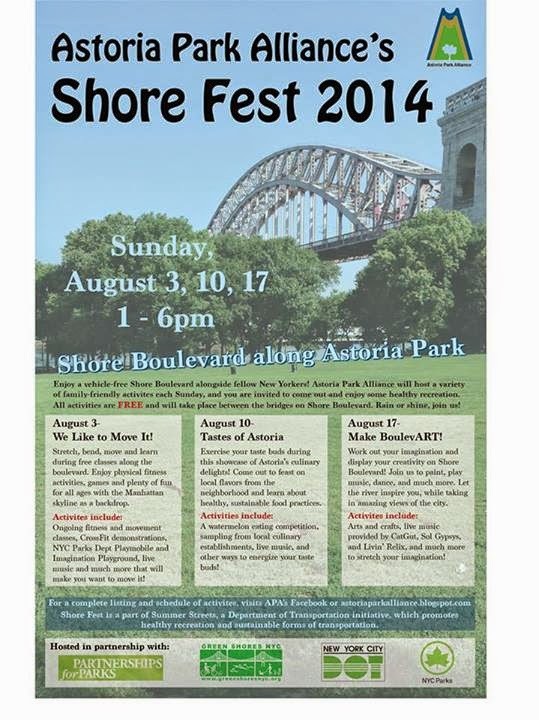 Exercise your taste buds during this showcase of Astoria’s culinary delights! Come out to feast on local flavors from the neighborhood and learn about healthy, sustainable food preparation. A watermelon eating competition, sampling from local culinary establishments, live music, and other ways to energize your taste buds. August 17th – Make BoulevART! Work out yor imagination and display your creativity on Shore Boulevard! Join u to paint, play music, dance and much more. Let the rier inspire you, while taking in amazing view of the city. Arts and crats, live music provideid by CatGut, Sol Gypsys, and Livin’ Relix, and much more to stretch your imagination! Next articleFREE BEER AND CHEESE! ?